August 17 is Indonesia’s Independence Day and is celebrated through out country by its people who actively participate in difference kinds of activities. 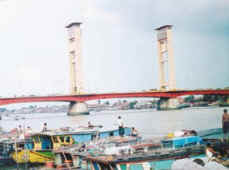 In Palembang the capital of South Sumatra Province, the people have unique celebration with a Bidar (canoe) race, held on Musi River which Meanders through the city. The canoes are shaped to resemble animals heads each of which can hold 40 rowers in colorful out fits. It is a one day celebration and starts after the flag hoisting ceremony in the morning, the followed by exhibition of handicrafts and cultural performance.